We rate this rumor a 8 out of 10 on our confidence scale. The reason we are subtracting two points is due to the fact that we are not confident our source material reflects a fully finalized design. As such, there is a possibility that small changes may still occur before the phone makes it into production, as we don't expect Google to announce this device before October. Still, we are exceptionally confident that this image represents the overall look and feel of Google's new smartphone, even if some small elements may not end up being representative of the final product. As you can see above, the Pixel 2 XL follows 2017's trend of smaller bezels. It seems clear that LG is the maker of the front panel as it has the same flat design of the G6 although it still has a subtle curve near the edges. However, the curved edges don't seem to be as pronounced as Samsung's Galaxy S8. Still, the lengthening of the screen and tightening of the bezels while still keeping the overall smaller shape maintains ergonomics. There's a wide speaker grille at the top but it's hard to say if this will be able to create a "stereo" effect with the bottom firing speaker similar to HTC phones. The back of the phone keeps a similar motif as the original Pixel phones albeit with the glass portion taking up less space. The fingerprint sensor seems to be on the aluminum part instead of the glass this year. The camera sensor is much larger, which is encouraging given how outstanding the original Pixel cameras were. Though it seems that Google is skipping out on the dual lens cameras that have become all the rage. 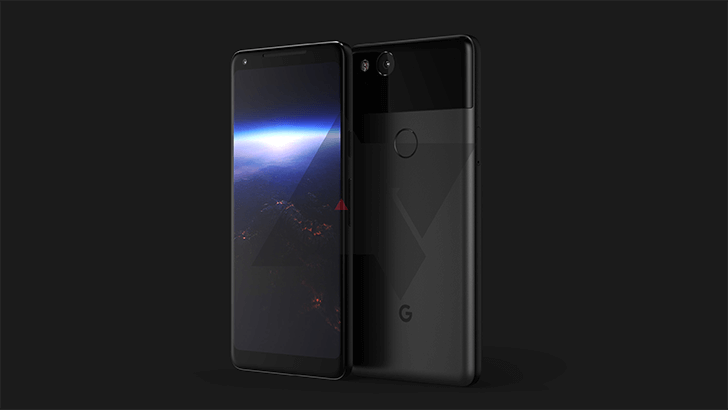 We'll still have to wait a few more months before the Pixel 2s are revealed to the world, but if rumors prove at least partly accurate Google appears to have designed a sleek and modern Pixel that may tempt this iPhone owner to switch back to Android.